For other uses, see University College Hospital (disambiguation). University College Hospital (UCLH) is a teaching hospital located in London, England. It is part of the University College London Hospitals NHS Foundation Trust and is closely associated with University College London (UCL). The hospital is located on Euston Road in the Bloomsbury area of the London Borough of Camden, adjacent to the main campus of UCL. The nearest London Underground stations are Euston Square and Warren Street, with Goodge Street nearby. 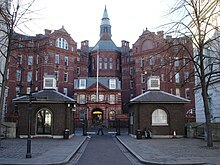 The hospital was founded as the North London Hospital in 1834, eight years after UCL (then known as the London University), in order to provide clinical training for the "medical classes" of the university, after a refusal by the governors of the Middlesex Hospital to allow students access to that hospital's wards. It soon became known as University College Hospital. In 1835, Robert Liston became the first professor of clinical surgery at UCH, and the first major operation under ether in Europe was conducted at the hospital by Liston on 21 December 1846. UCH was split from UCL in 1905, and a new hospital building designed by Alfred Waterhouse, known as the Cruciform Building, was opened in 1906 on Gower Street. UCH merged with the National Dental Hospital in 1914, and the Royal Ear Hospital in 1920. George Orwell married Sonia Brownell in 1949, and later died 21 January 1950, in room 65 of the hospital. The hospital was run by the Bloomsbury Area Health Authority from 1974. In 1994 UCH became part of the University College London Hospitals NHS Trust. The hospital site at the Cruciform Building was closed in 1995, despite strikes and an occupation in 1993. The building was purchased by UCL, for use as the home for the Wolfson Institute for Biomedical Research and the teaching facility for UCL bioscience and medical students UCL Medical School. A new 75,822 m² hospital, procured under the Private Finance Initiative in 2000, designed by Llewelyn Davies Yeang and built by a joint venture of AMEC and Balfour Beatty at a cost of £422 million, opened in 2005. In October 2006, the hospital was nominated and made the Building Design shortlist for the inaugural Carbuncle Cup, awarded to "the ugliest building in the United Kingdom completed in the last 12 months", which was ultimately awarded to Drake Circus Shopping Centre in Plymouth. Facilities management services are provided by Interserve. In November 2008, the £70 million Elizabeth Garrett Anderson Wing was opened, allowing the hospital to offer all women's health services in one place (except some breast and gynaecology services). The hospital has 665 in-patient beds, 12 operating theatres and houses the largest single critical care unit in the NHS. The Accident & Emergency department sees approximately 120,000 patients a year. It is a major teaching hospital and a key location for the UCL Medical School. It is also a major centre for medical research and part of both the UCLH/UCL Biomedical Research Centre and the UCL Partners academic health science centre. The urology department moved to University College Hospital at Westmoreland Street, formerly the Heart Hospital, in 2015. ^ a b c "UCLH". Interserve Plc. Retrieved 10 September 2010. ^ a b c d e "UCLH trust chronology". University College London Hospitals NHS Foundation Trust. Archived from the original on 11 April 2009. Retrieved 10 September 2010. ^ "Overview of Robert Liston". ^ Flemming, P. (1926). "Robert Liston, the first professor of clinical surgery at UCH". University College Hospital Magazine. 1: 176–85. in Gordon, R. (1983), p. 146. ^ Cavendish, Dominic (1 August 2017). "The It Girl who tried to save George Orwell – and how Cressida Bonas will bring her alive in a new play". The Telegraph. ISSN 0307-1235. Retrieved 13 October 2018. ^ "The South London Women's Hospital Occupation 1984–85". Past tense. Retrieved 7 April 2014. ^ University College London (21 May 2018). "Cruciform Building". Wolfson Institute for Biomedical Research. Retrieved 2 February 2019. ^ "University College Hospital". E-Architect. Retrieved 13 April 2018. ^ "University College London Hospitals wins award for Best Health Project (over £20 million)". University College London Hospitals NHS Foundation Trust. Archived from the original on 24 January 2007. Retrieved 10 September 2010. ^ "University College London Hospital". ASM. Retrieved 11 April 2018. ^ Watson, Anna (22 July 2010). "Six in race for Carbuncle Cup". bdonline.co.uk. Retrieved 21 September 2016. ^ bdonline.co.uk. "Bottom of the barrel - Carbuncles 2006". Retrieved 11 September 2014. ^ "New EGA Wing opens to mothers and babies". University College London Hospitals NHS Foundation Trust. Archived from the original on 11 November 2010. Retrieved 10 September 2010. ^ a b "University College Hospital". University College London Hospitals NHS Foundation Trust. Archived from the original on 27 November 2010. Retrieved 10 September 2010. ^ "University College London Hospitals: Emergency Services". University College London Hospitals NHS Foundation Trust. Archived from the original on 10 November 2010. Retrieved 10 September 2010. ^ "Bloomsbury Campus". UCL Medical School. Retrieved 10 September 2010. ^ "Home". UCLH/UCL Comprehensive Biomedical Research Centre. Archived from the original on 25 August 2010. Retrieved 10 September 2010. ^ "About us". UCL Partners. Archived from the original on 10 September 2010. Retrieved 10 September 2010. ^ UCLH Web site: Refurbishment of the Heart Hospital, 18 May 2015, retrieved 15 September 2015 "The Heart Hospital is being refurbished and will reopen at the beginning of the summer to provide thoracic surgery and urology services ... it will be called University College Hospital at Westmoreland Street." Wikimedia Commons has media related to University College Hospital.